During this cruise we shall sail past Valletta, Malta's Capital City, the Grand Harbour Entrance, Marsascala Bay, St. Thomas Bay, Island Bay and Peter's Pool, past Delimara Point and Marsaxlokk Bay, Malta's largest fishing village and past the Blue Grotto, giving you a view of these fascinating colourful caves. The vessel also cruises past the imposing Dingli Cliffs and the little island of Filfla and past some of Malta's most popular sandy beaches. A particular attraction is Anchor Bay. This rocky cove incorporates 'Popeye's Village', the actual set of the film 'Popeye Village' was shot on location. 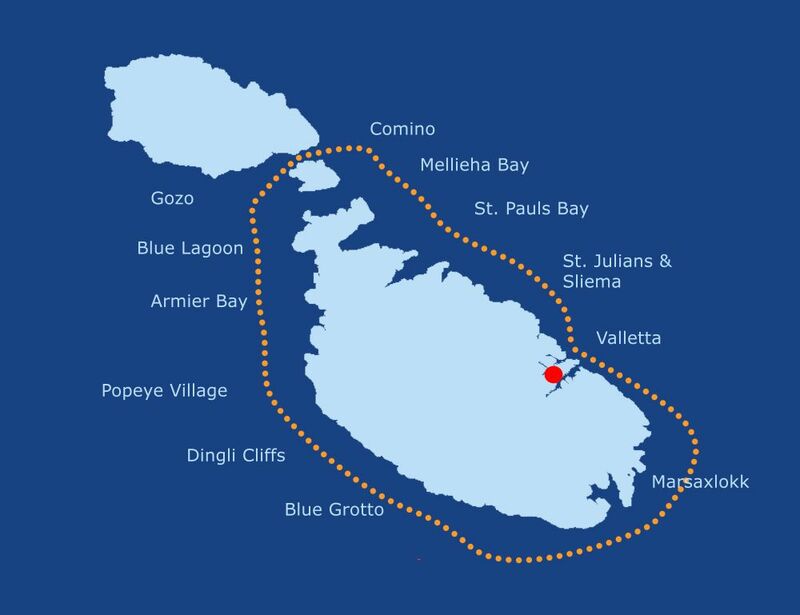 We also cruise past Mellieha Bay and St. Pauls Island, where St. Paul was shipwrecked in 60AD Then onto Salina Bay, St. Andrew's, the casino and the picturesque St. Julians Bay.